The forged and oil-hardened chrome-vanadium steel makes the instrument particularly rugged and durable. You can put a tremendous amount of pressure on them knowing that the jaws won't deform. The long and slim jaws with tips tapering to 1mm (1/32") thickness make the tool particularly suitable for exact assembly, bending, and adjusting work. The needle nose is a little tight, so it doesn’t open or close with ease. KNIPEX Tools 3111160 boasts a practically limitless range of applications. They should be able to last you a lifetime, able to live through decades of professional abuse. 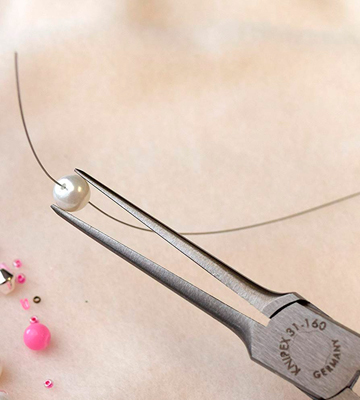 Though versatile, these need-nose pliers are particularly great for jewelry designers. The 45-degree bent nose of the extra pliers, along with their long 13.25-inch reach and compound action joint, provides increased access in tight spaces with minimal hand movement. Incorporating flush rivets, the manufacturers have been able to design these tools with extra strength and a thinner profile. The tips are so sharp that the instrument requires careful storage. Crescent PSX204C is a great 2-piece set for electricians. There isn't an object you won't be able to grab and a place you won't be able to reach. 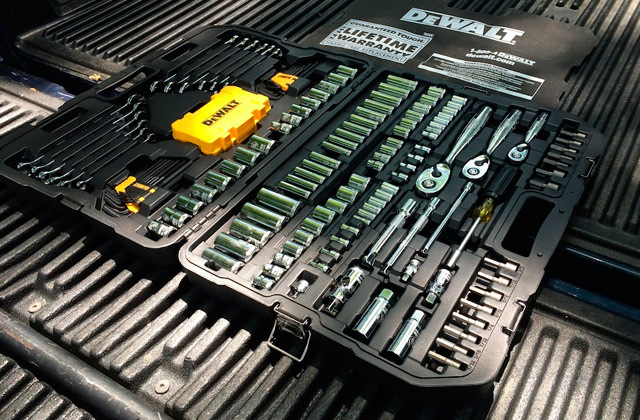 The set is an equally good option for professionals, aspiring handymen, and any homeowner who's into the whole DIY thing. Armed with a long, tapered nose and fine tips, it gives you the precise grip and excellent control necessary for delicate jobs. The cross-cut teeth allow you to push, pull, and twist without slipping. They apply even pressure and equal grip in any direction, making these pliers a multipurpose tool suitable for practically any job. 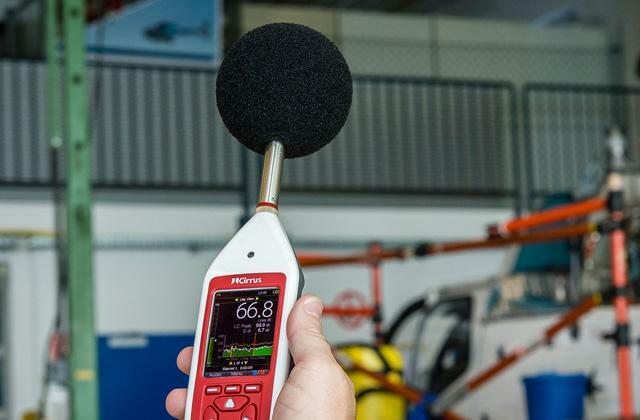 Tekton 34401 is as practical and functional of an instrument as they come. It will prove invaluable for electrical assembly technicians. You'll definitely find some use for it in construction work. As far as the price-performance ratio is concerned, this is the best bang for your buck here. The dual-pivot design gives you an increased jaw opening. Since the center section stays relatively narrow, you're able to work in the most confined areas. Incorporating milled grooves in the tips, its gripping surface tightly grabs any small object and doesn't let it go. The tool is relatively heavy. Zenith ZN502652 isn't without its flaws. But those flaws pale in comparison to everything this tool has to offer. Though a little heavy, the pliers are comfortable and, for the most part, a real pleasure to work with. 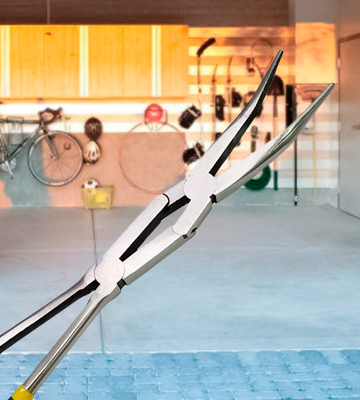 The PVC-coated handle gives you a comfortable enough grip to protect your arm as you cut and twist wires. The spring-loaded design at the rear keeps the jaws open. This way, you get a lot less hand fatigue. With their knurled jaws and a slim hinge, you'll be able to maintain efficiency in spaces with limited wiggle room. The grips start to slip down with time. Whizzotech W9101 is the cheapest pair of needle-nose pliers on our list but it doesn't really reflect on their quality. It may not be the most versatile tool in this review but it does work wonders in those relatively limited areas of application. 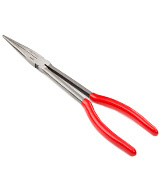 Being thin and long, needle-nose pliers aren't known for their sturdiness and durability. With KNIPEX Tools 3111160, however, that's hardly the case. Its chrome-vanadium steel foundation is rough and robust in and of itself. Add to that the fact that it's been forged and oil hardened and you have yourself arguably the best needle-nose pliers as far as durability is concerned. You can put a tremendous amount of pressure on them knowing that the jaws won't deform. Plus, the model pretty damn good too. Sure, it isn't like the tool is without its flaws. For our taste, the needle nose is a little too tight, so it doesn’t open or close as easily as some of its competing counterparts. But that's about the only thing we don't like here. Set that aside and you have a pair of precision pliers particularly suitable for exact assembly, bending, and adjusting work. Its long and slim jaws with tips tapering to 1mm (1/32") thickness will let you reach any wire in any space no matter how confined. The smooth ground gripping surfaces with carefully deburred edges will make the job seem and feel simple and effortless. What else is there to say? 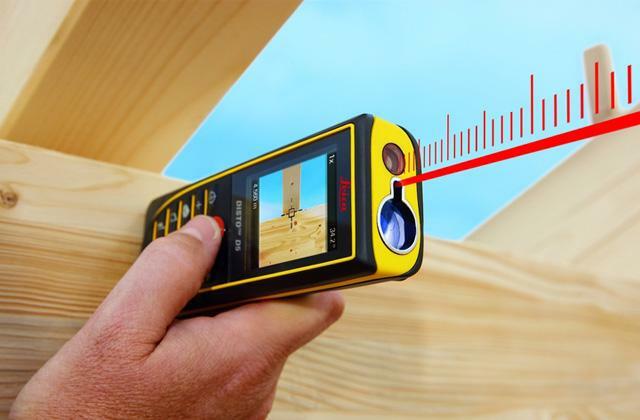 The instrument's range of applications is practically limitless. They should be able to last you a lifetime, able to live through decades of professional abuse. 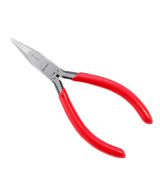 Though versatile, these need-nose pliers are particularly great for jewelry designers. Crescent PSX204C doesn't offer a single tool but instead a 2-piece set, including a pair of bent pliers with a curved beak in addition to the usual needle-nose pliers. The 45-degree bent nose of the former pliers, along with their long 13.25-inch reach and compound action joint, provides increased access in tight spaces with minimal hand movement. Incorporating flush rivets, the manufacturers have been able to design these tools with extra strength and a thin profile. But if there's one thing that truly makes the product one of the best needle-nose pliers, it has to be the dual material grips. 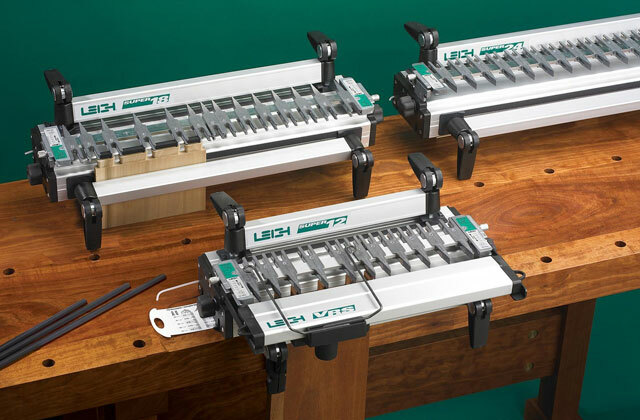 They don't just make the tools more comfortable but also improve your control and increase performance. 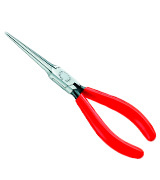 Both of the pliers' tips, ground with milled grooves, let you tightly grip fasteners and other smaller objects. Frankly, the only downside to these tools inevitably stems from their upside. The aforementioned tips are so sharp that the instrument requires extra careful storage. 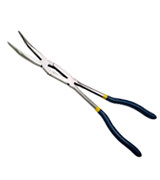 Made of corrosion-resistant alloy steel, the pliers are able to maintain their appearance and sharp qualities for a long time. In other words, Crescent PSX204C is a great 2-piece set for electricians. There isn't an object you won't be able to grab and a place you won't be able to reach. The set is an equally good option for professionals, aspiring handyman, and any homeowner who's into the whole DIY thing. 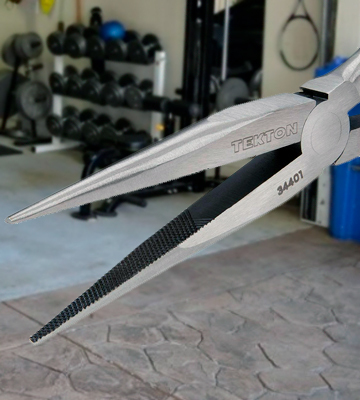 Tekton 34401 are pretty much everything needle-nose pliers ought to be. Comprised of high-strength chrome-vanadium steel, the tool is virtually indestructible. Armed with a long, tapered nose and fine tips, it gives you the precise grip and excellent control necessary for delicate jobs. It fits into just about any tight spot, lets you grip smaller parts, and bend wires with relative ease. The nose isn't the only long part of this tool. 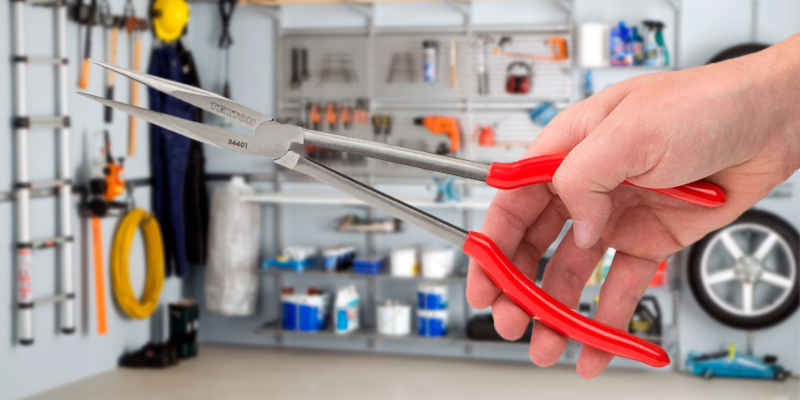 With extra-long handles, these pliers allow you to reach narrow spaces, all while keeping your hands away from hot surfaces and dangerously sharp edges. That being said, the biggest selling point of the tool is, without a doubt, its cross-cut teeth. They allow you to push, pull, and twist without slipping. 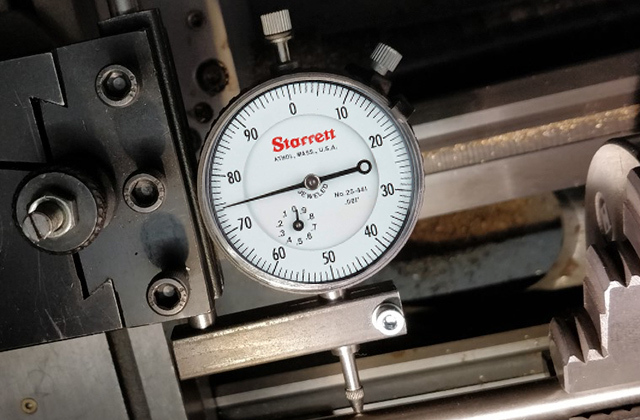 But, better yet, these teeth apply even pressure and equal grip in any direction, making them perfect for practically any job. 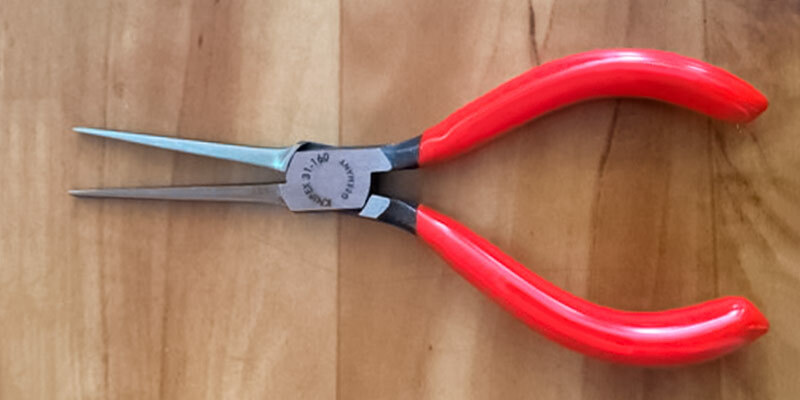 The only real issue we have with these pliers is that the aforementioned high-strength steel construction doesn't incorporate a scratch-resistant finish, so they do lose their otherwise sleek appearance after a couple of years. Other than that, Tekton 34401 is as practical and functional of an instrument as they come. 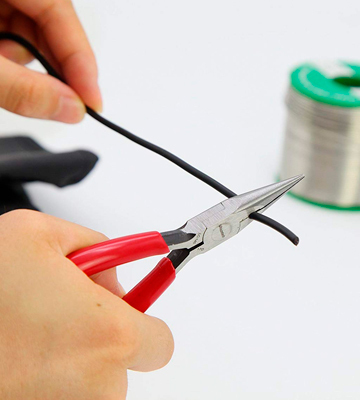 It will prove invaluable for electrical assembly technicians. You'll definitely find some use for it in construction work. As far as the price-performance ratio is concerned, this is the best bang for your buck here. Needle-nose pliers are long by design but Zenith ZN502652 is really, really long even in comparison to most of these pliers. With 2.875-inch jaws and 13.25 inches in overall length, you'll be able to reach wires and various objects in the most confined spaces. But it isn't just about their length either. The most important feature and arguably the most defining characteristic of this product is its dual-pivot design. Twice the number of joints gives you an increased jaw opening. Since the center section stays relatively narrow, you're able to work in the tightest areas. The non-slip handle does not incorporate a rubber grip but it is surprisingly comfortable. Having said all of that, the length of the tool doesn't come without its compromises. 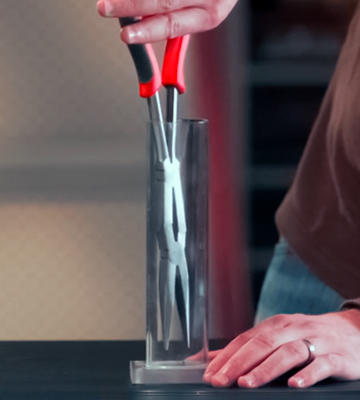 Although the handle sure is comfortable, given the pliers' weight of 12.8 ounces, your hand will get tired sooner rather than later. Aside from that, there isn't that much that separates the model from the rest of its peers. 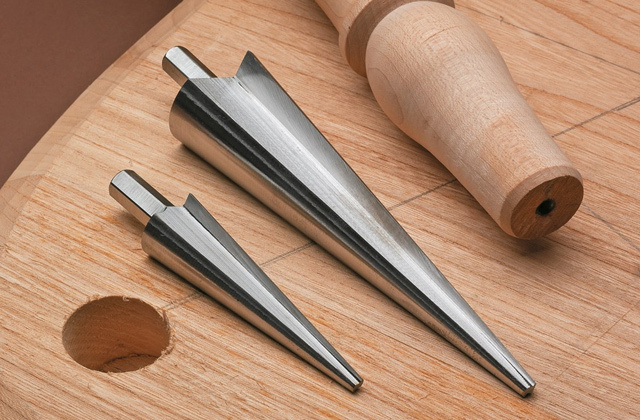 Incorporating milled grooves in the tips, its gripping surface tightly grabs any small object and doesn't let it go. All in all, Zenith ZN502652 isn't without its flaws. But those flaws pale in comparison to everything this tool has to offer. Though a little heavy, the pliers are comfortable and, for the most part, a real pleasure to work with. Whizzotech W9101 is the cheapest pair of needle-nose pliers in this review but it doesn't really reflect on their quality. Sure, it does have a weak spot or two but nothing that we would describe as a dealbreaker. 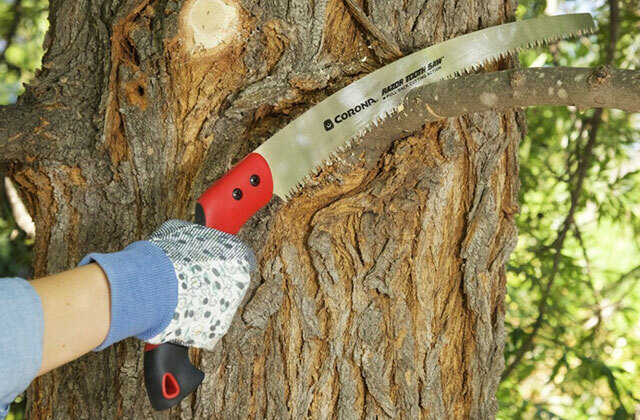 The model's PVC-coated handle gives you a comfortable enough grip to protect your arm as you cut and twist wires. That plastic coating does lose its grip over time and starts to slip down but we would hardly qualify the need to adjust the former as a huge pain in the rear. Especially if you add the spring-loaded design at the rear that makes these pliers keep their jaws open. This way, you get a lot less hand fatigue. With 0.85-inch long jaws and 4.5 inches in overall length, the tool is relatively short. 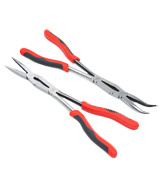 It makes the pliers a little less suitable for electricians but also a lot more suitable for jewelry making, arts, and crafts. With their knurled jaws and a slim hinge, you'll be able to work in small tight spaces, effortlessly holding and twisting any object. With these things, you might not be able to reach every wire and every cable but the ones you do reach won't be able to resist your gripping, bending, twisting, and cutting. To sum it all up, the affordable price tag and practical build earned Whizzotech W9101 a spot on our list. 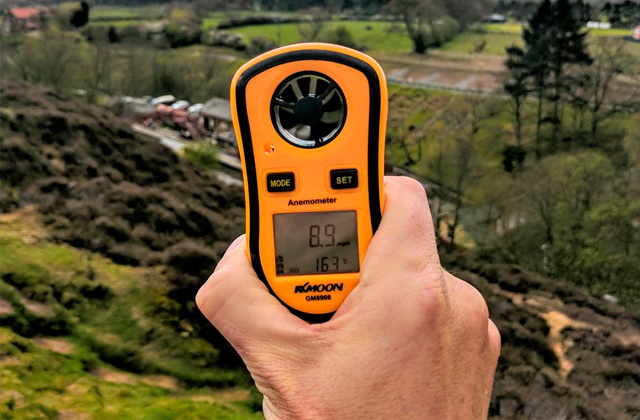 It may not be the most versatile tool in this review but it does work wonders in those relatively limited areas of application. 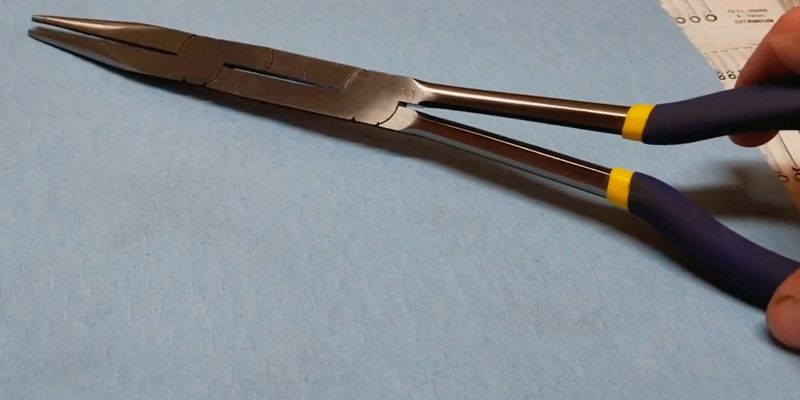 What Are Needle Nose Pliers? You know, for a fairly simple tool, needle-nose pliers sure have a lot of names. 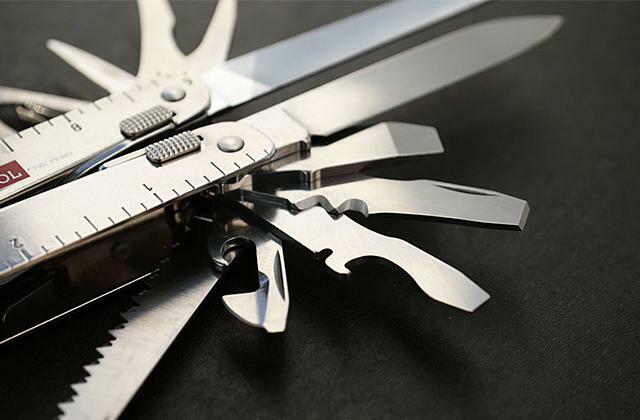 Often referred to as long-nose pliers, pointy-nose pliers, pinch-nose pliers, or snipe-nosed pliers, the tool is used by network engineers, jewelry designers, artisans, network engineers, electricians, and other types of tradesmen to re-position, bend, and snip wires. The namesake nose gives the user superior control, all while the cutting edge near their joint gives you that "one-tool" advantage that makes them a smart investment. 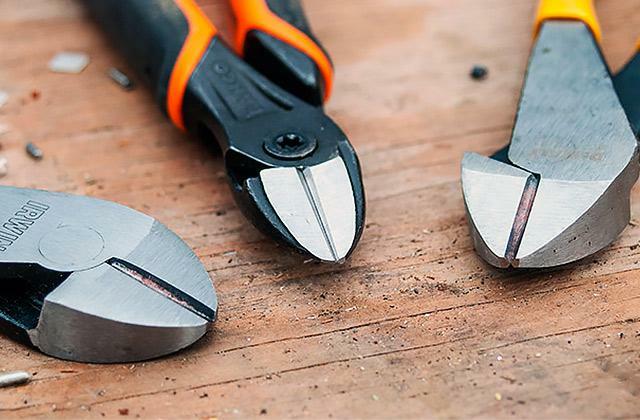 Naturally, the length of the nose and the tool in general makes these pliers great for reaching into smaller areas where cables. 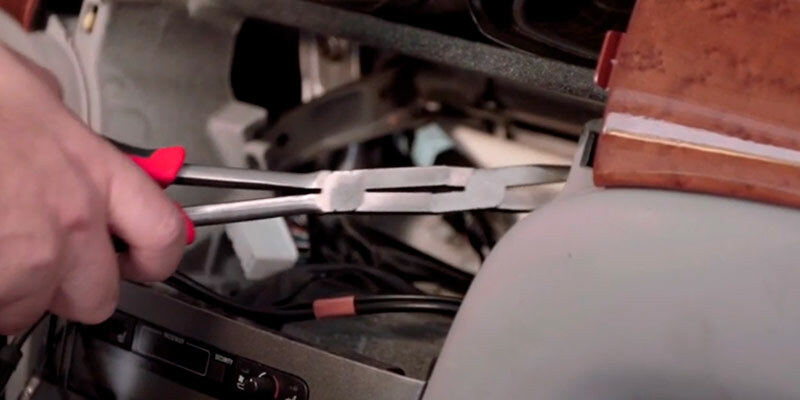 Using needle-nose pliers, you'll be able to reach cables and various materials stuck in places unreachable with an inferior tool. 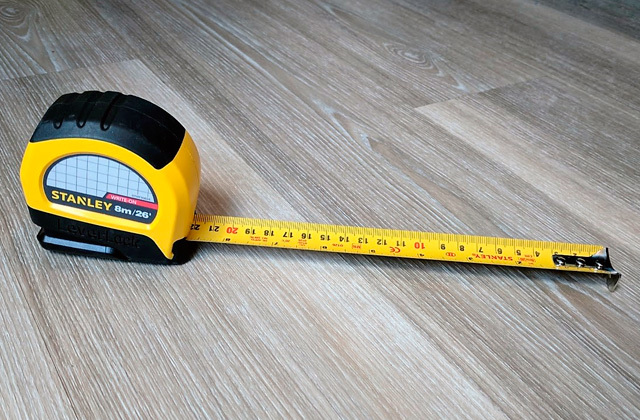 Though they all give you a long reach, there isn't really a standard, so keep in mind the length of the jaws and the whole thing as you go looking for the right model. Other than that, the rules here are more or less the same as they are with any other tool: go for a model with a comfortable handle, quality jaws, and suitable for your future projects. To identify the wires within the walls, you'll need a stud finder, so you might want to grab one while you're at it. 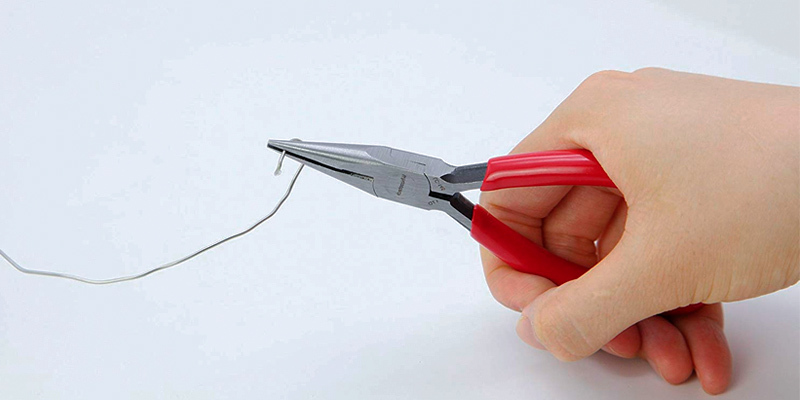 And when it comes to larger, more stubborn wires, you'll probably be better off with a wire cutter.